Complain ? Who me ? Never ! For anyone that lives as an expat in Cambodia, you will understand how utterly hilarious the above photo is. The Phnom Penh post has reported that concerned citizens are being encouraged to leave their complaints in this special box, which was placed outside the entrance to the Council of Ministers at the beginning of December. Long-time observers say, however, that few, if any Cambodians have taken advantage of it. Quell surprise! Considering there is probably a pipe attached to it which feeds straight to the Mekong! A complaints box about the de-beautification of the city outside the Ministry of Urban Planning? 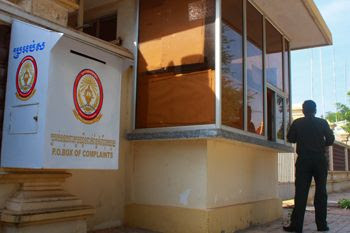 A complaints box about corruption outside Hun Sen’s private abode in Takmeo? ( If you put anything in this box an auto-sensor triggers a robotic sniper to take a head shot on you ). Your suggestions for more complaints boxes are welcome. Please put them in the suggestions box.